Nepal Startup Meet is the gathering of the Startups, business houses, Policy makers, Diplomatic Agencies along with NGO’s and INGO’s under a common umbrella. Nepal Entrepreneurs Society encourages job creators not job seekers. Hence, to support and encourage the young Nepalese job creators (entrepreneurs), NES has initiated Nepal Startup Meet. 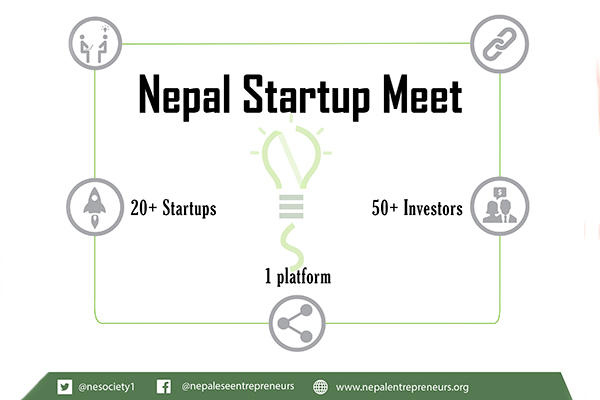 Nepal Startup Meet aims to provide a platform for the young entrepreneurs to share about their startups and the problem they are facing in the sector of startup. Nepal Startup meet will be a step towards reducing the gap between the startups and the business hubs, policy makers, Diplomatic agencies etc. It is a part of 10000 startup project initiate by the Nepal Entrepreneurs Society which aims to groom the young minds working in the sector of Entrepreneurship. In Nepal Startup meet, an entrepreneur who has just initiated a startup can share his startup as well as get a chance to find a potential investors as well as funding agencies. 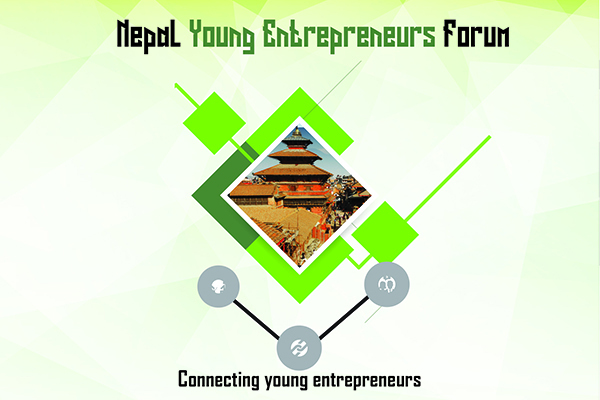 Nepal Young Entrepreneurs Forum is a yearly entrepreneurs gathering that will be conducted for Nepalese Entrepreneurs only. The forum will be a platform for the entrepreneurs to learn from the successful entrepreneurs of Nepal. NES believes that mentorship is very important for the entrepreneurs to groom and learn, hence, Nepal Young Entrepreneurs Forum will be providing the mentorship for the young entrepreneurs. In the annual event, Nepal Young Entrepreneurs Forum will gather young entrepreneurs, successful business personals, policy makers and provide a common learning, networking and experience sharing platform. Nepal Young Entrepreneurs Forum will be 4 days event where the youth will be engaged in multiple lectures, idea pitching, mentorship, teamwork, networking sessions, fun sessions, presentation and competitions guided by a curriculum. The event will invite several renowned faces of Nepal who will help the young entrepreneurs learn about grooming the startups with the help of real life lessons and experiences. 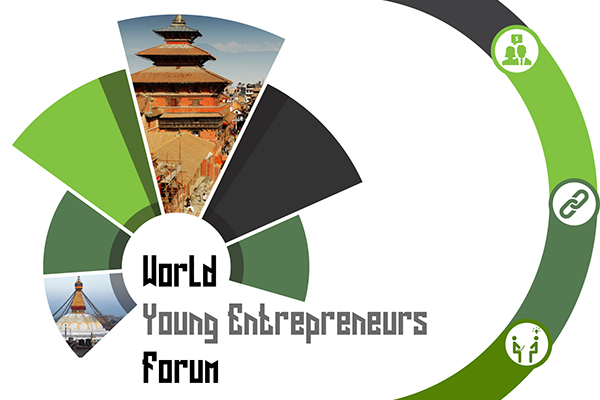 World Young Entrepreneurs Forum is another yearly event which aims to gather entrepreneurs from all around the globe. Only selected Entrepreneurs from all around the globe will be invited in this forum. World Young Entrepreneurs Forum will provide a platform for the young entrepreneurs to learn from the successful entrepreneurs as well as business personals and connect with other fellow entrepreneurs. The World Young Entrepreneurs Forum will invite several young entrepreneurs from all around the globe. The forum will be of 4 days comprising of lectures, idea pitching, mentorship, teamwork, networking sessions, fun sessions, cultural exchanges, presentation and competitions guided by a curriculum. The main aim of the forum will be to help participants know about the entrepreneurial ecosystem and development of other countries along with the providing the participants of different background, nationalities to work together. NES will be conducting meet-up and gathering on last Friday every month. These gathering will be conducted on colleges and hotels where all the members of Nepal Entrepreneurs Society will be invited. The meet-up will invite lots of renowned people as the guest/ speaker who will be sharing and discussing about the entrepreneurship and entrepreneurial ecosystem of Nepal. The event will be mainly designed for the young entrepreneurs where they can learn from the success as well as failure story of the invited guests. 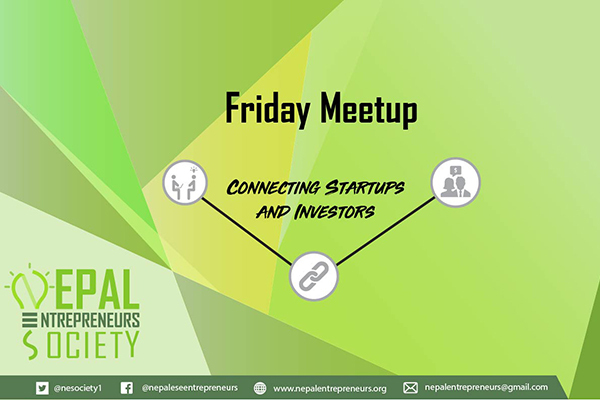 The Meetup will have discussions on various aspects of Entrepreneurship in Nepal, the pros, cons and possibilities along with the major discussion about creating the entrepreneurial ecosystem in Nepal. The meetup will be of one hour and will have plenary and interactive session.